The Software Product Return Agreement is used when you are selling a software product and have a return policy. Not only is stolen credit card fraud a major problem, but fraudulent returns by individuals keeping your product is also a problem. Using a strict return policy requiring signatures and stating the legal issues regarding continued use of fraudulently returned products will reduce the rate of fraudulent returns. Use this form when someone requests a return. This Software Product Return Form is included in editable Word format that can be customized in Word or by using the included Wizard software. Company Name ("Company") will accept returns of digitally delivered products on a case-by-case basis and reserves the right to deny any request it receives based on the information provided to Company. This form does not absolve or relieve you of any possible copyright infringement or claim that may arise out of the continued use of third-party software licensed to you by Company Name under this agreement. In consideration of my request of a refund, I (print your name as it appears on the billing statement for the product that you purchased and wish to return) certify that: (i) I have removed from all computers any and all copies of the software product listed below that I obtained via an electronic software download from Company and I have not retained or distributed any copies to any other party, thereof; (ii) I have not copied, created backups, decompiled, reverse engineered or produced any portion of the software product in any perceivable form; and (iii) I acknowledge that any continued use of the software product, whether by myself or any other party connected to me, would constitute willful copyright infringement for which I may be liable for statutory damages of up to $150,000. Customer grants to Company or its independent accountants the right to examine its books, records and accounts during Customer's normal business hours to verify compliance with this Agreement. In the event such audit discloses non-compliance with this Agreement, Customer shall promptly pay to Company the appropriate licensee fees. Applications for a refund for a software product delivered via an electronic software download transaction must be received within 30 days of the date you purchased the software product and must be approved by Company prior to being processed. Incomplete, illegible or otherwise improperly received forms will not be processed and your return may be delayed or denied accordingly. Applications for a refund must be received by either fax or mail as indicated above. You must include the reason you are requesting a refund, and the return request MUST be signed by the original purchaser as stated on the billing or credit card receipt received by Company, as well as an Officer of your company. Company Name Attention: Return Dept - Fax Fax Number. Important: Email, Adobe PDF, Email Faxes or other Electronic delivery of this form will NOT be accepted. Third-Party Manufacturers Product Return Policies. Third-party products purchased from Company Name may require an additional return submitted to the third-party manufacturer. Signature lines must be completed by both the original purchaser and a company officer. 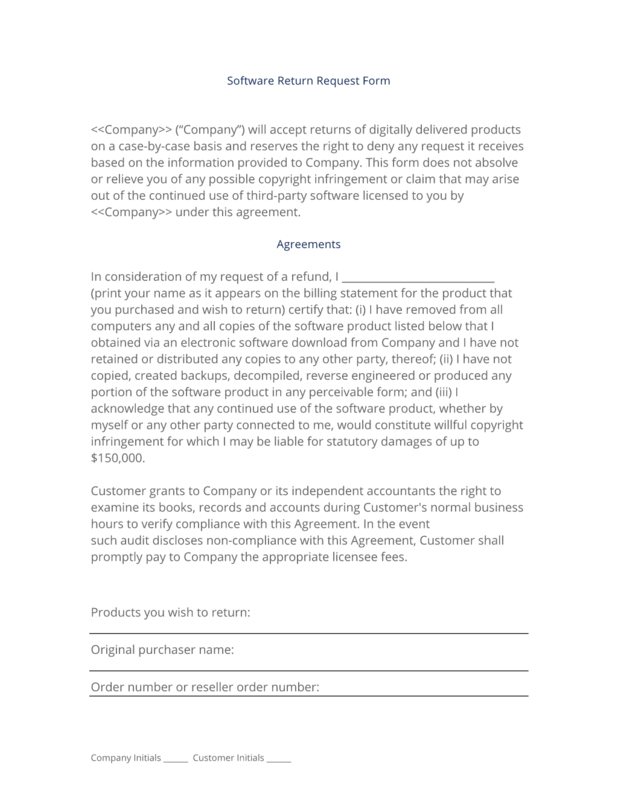 The complete Software Product Return Form - with the actual formatting and layout - is available in this Contract Pack.